Ash Wednesday marks the beginning of the Season of Lent - a period of 40 days given by the Holy Mother the Church to prepare meaningfully and celebrate worthily the Paschal Mystery (the Passion, Death and Resurrection) of Jesus Christ. This year Ash Wednesday fell on March 9. The tremendous love of Jesus for us is clearly manifested in His own words: "There is no greater love than this, to give one's life for his friends" (Jn 15: 13). Despite our sinfulness Jesus calls us "His friends. "How are we going to reciprocate Jesus' unfathomable love for us? The Holy Eucharist is the source and summit of Christian life and mission. It is the very "heartbeat" of the Christian community. Therefore, a Season of Lent centred on the Holy Eucharist will definitely help us to reciprocate the unfathomable love of Jesus. Recalling the significance of the Easter Triduum- the three most important days for all Christians, namely- Maundy Thursday, Good Friday and Holy Saturday will help us in our preparation. Institution of the Holy Eucharist - (To be our spiritual food. To be with us until the end of this world). Washing of the feet - (Servant leadership). Agony in the Garden of Gethsemane- (Complete submission to the will of the Father). Scourging at the pillar and crowning with thorns carrying the cross to Calvary Crucifixion Death - (The "Hour of Glory") Jesus suffered this excruciating pain, mental agony and humiliation for our redemption. There is no act of worship greater than the Holy Mass. Let us strive to attend Holy Mass daily or at least on every Thursday and Friday in addition to Sunday. Why Thursday? It was on a Thursday that Jesus instituted the Sacrament of His Body and Blood. We have lost the sense of sin. Our conscience is warped. It is "immune to pricking"! The need to make a good confession arises from our genuine sorrow for hurting Jesus who calls each and everyone of us "My Friend." Meditation on the passion and death of Jesus leads us to genuine sorrow for our sins and this sorrow will lead us to make a good confession and seek pardon for our sins. It will also give us the grace to forgive those who hurt us.Do not wait till the very end to make a good confession. The ideal would be to go to Confession just before, or on, or soon after Ash Wednesday, and again during the Holy Week. a) Listen attentively to the Word of God during Holy Mass. b) Read the Passion narrative in the four Gospels and meditate on the tremendous love of Jesus. Or, read completely. one of the Gospels during the 40 days. (This should be done daily. Perhaps the time we spend in front of the television could be reduced for this purpose). c) Continue the habit of reading and meditating on the Word of God daily, even after the Season of Lent. c) Pray for the sick, the injured, the poor, and other less-fortunate brethren. a) Use the God-given talents to help others, the Church and our community. b) Give up something that is difficult to be without (eg. favourite dish sweets entertainment drinks cigarettes) and donate the money saved to the less-fortunate brethren. Encourage your children also to do this. They can collect their savings in a till and experience the joy of sharing it with the poor on Easter Sunday. It is the most important prayer of the Holy Mass. Follow every word of this beautiful prayer very attentively. During the consecration of the bread and wine, thank Jesus for instituting the Holy Eucharist and dying for us. a) Always be in a state of grace when receiving the Body and Blood of Jesus. Instil this need in the minds of all (very specially the children, youth and young adults), making them aware of the warning given by St. Paul in I Corinthians 11:26-29.
b) Walk up to the altar and return with joined hands. 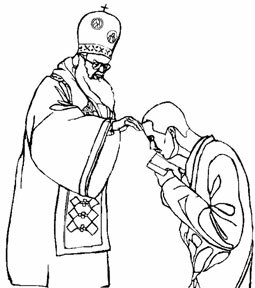 c) Always kneel to receive Holy Communion. (The aged, physically handicapped and those suffering from arthritis or similar ailments may stand) d) Spend much time in silent prayer after receiving Holy Communion. a) Always remember the 'Washing of the Feet" by Our Lord Jesus Christ. This is the perfect example of the servant - leadership of Jesus. Try to be kind and understanding towards subordinates, employees, and domestic workers. Our attitude towards our parents, children, siblings, students, teachers, elders, neighbours, our less fortunate brethren and even to our superiors and those in authority (including the Church authorities) should be based on "the washing of the feet." The same applies to those in authority too. b) Visit the sick and the injured and those who are abandoned and lonely, the aged, and other less fortunate brethren. c) Give financial and material help to those in need and to orphanages and other charitable institutions. d) Be honest in all dealings. Be honest at the work place. Live the Eucharist and let others see Christ in us. a) Let us visit Jesus, adore Him, praise Him and thank Him. b) Always genuflect when entering and leaving the church. We should go on our knees when the Most Blessed Sacrament is exposed. Always be modestly dressed, very specially when in church and other places of worship. Modesty in dress should not be confined to the Season of Lent only. a) The Way of the Cross (Preferably daily. At least every Friday during the Season of Lent). b) Fasting and Abstinence on Fridays. Beginning from this Season of Lent, try to abstain from meat, fish and eggs on every Friday of the year, as a sign of our love for Jesus who died on a Friday. c) Let one meal (either lunch or dinner) be vegetarian on every day other than on Sundays during the Season of Lent. d) Singing of "Pasan" (composed by the famous 18th century missionary, Fr. Jacome Goncalves) in the churches or in the homes. The Risen Lord Jesus wanted us to continue His Mission. He commanded us; "Proclaim the good news to all nations. Baptize them" (Mt 28: 19, Mk 16: 15, Lk 24:48, Jn 20:21 and Acts 1 :8). May this Season of Lent help us to celebrate worthily the Pascal Mystery of Jesus, and also pave the way for all of us to become Spirit - filled witnesses of the Risen Lord Jesus, in our families, neighbourhood and communities.